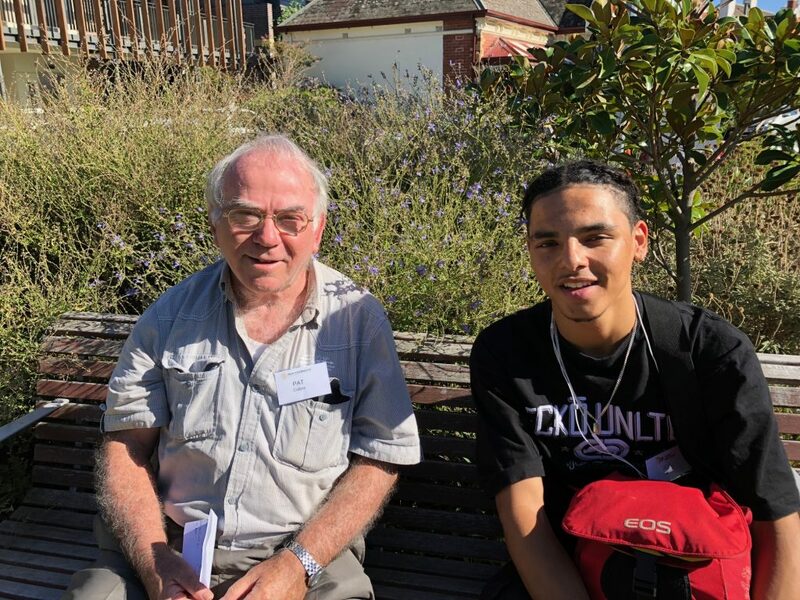 Pat Collins and Joseph Taylor hit it off straight away when they met for the first time as part of the Fitzroy High School/OCAV Intergenerational Project. They share a passion for travel and yearning to see the world. Pat, at 74, has covered a fair bit of territory since he took off to Papua New Guinea when he was just 19 years old. Joseph is keen to follow suit and wants to head off on travel adventures once he qualifies as a barber. Pat’s travels feature prominently in the story board that Joseph wrote after interviewing Pat this year as part of the Year 12 students’ Work Related Skills unit. Joseph is one of the Fitzroy High School’s Year 12 VCAL students who took part in the intergenerational project, involving OCAV’s Rushall Park residents and neighbouring Fitzroy High School, which was a highlight of the school’s VCAL curriculum last year. The 12 VCAL students were matched with residents at Rushall Park and several interviews were conducted in term one. The project storyboards, which were unveiled at Rushall Park recently, are a wonderful snapshot of the lives of some OCAV residents, including Jean and Bernard Pidd and Jennifer Barden. Joseph, 18, was a bit apprehensive about the project and thought it might be a ‘boring essay’. But he ended up loving the experience and found Pat’s attitude to young people affirming, and a little surprising. “There is so much negative stuff in the media about young people. The news is full of all the things young people are doing wrong now. But when you meet Pat, it’s as if he hasn’t heard any of it. He just sees you as an equal who he wants to get to know. I think a lot of older people dismiss young people, but not Pat. He’s a good bloke who respects everyone. Pat’s cool,” Joseph said. Joseph, who started an apprenticeship as a barber at Kings Domain in South Yarra during the year while completing his VCAL, loved hearing about Pat’s adventures around the world. Once he is qualified he hopes to go travelling and go to the UK where he was born and where most of his family still lives. Pat, who came to Rushall Park three years ago, has more chapters that could be added to Joseph’s story board and has recently returned from a trip to India. He is thinking about heading to the United Kingdom and Ireland next year. He loves seeing the world and meeting people from different cultures and backgrounds, regardless of their age. “I think it’s a good idea to respect people whether they are 17 or 70. It’s a good starting point for a relationship. I enjoyed hearing about Joseph’s family background and all the things he would like to do in the world,” Pat said. Honey! I Shrunk the House!